Comin' in hot for the Fall of 2017 the Alpinestars Tech-Air Race Vest is finally making its US debut and is sure to shake up the motorcycle safety industry. It has been prevalent in the highest levels of motorcycle racing for some time now and is finally being made available to us mere mortals. The Tech-Air Race Vest differentiates itself from other airbag systems on the market in a few different ways. Firstly there are no tethers to your bike (physical or digital). 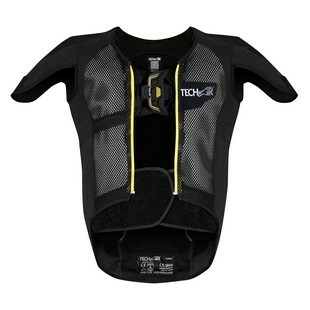 The vest includes an airbag control unit embedded in the affixed back protector and the control unit utilizes multiple sensors on the vest to detect shock or unexpected movement through algorithms. That is pretty much a fancy way of saying it knows when you crash. The Tech-Air system is not tied to one specific garment, so you need to purchase the vest along with any Tech-Air compatible jacket or race suit. This means after you finish riding on the track in your Tech Air race suit you can install the vest in your Tech-Air street jacket. To accommodate for the different variables of track versus street riding Alpinestars has two different algorithms available to be uploaded to the vest. It comes standard with the track algorithm that only uses one of the two charges available to inflate the vest. This means if you have a minor lowside you can pick your bike back up and still finish the rest of your session. The street algorithm on the other hand is set to use both charges (for faster inflation) and takes into account variables like being hit by a moving object at a stop. The vest is powered by a rechargeable battery that will give you 25 hours of use per six hours of charging. In a pinch however you can charge the vest for one hour to provide four hours of riding. LED indicators visible on the arm of whichever Tech-Air garment that you choose will display battery life as well as the status of the system. Overall the Alpinestars Tech-Air Race Vest is a revolutionary product. It offers a substantial amount of protection that does not require any type of external tethers. The idea of being able to swap vests between multiple garments opens riders up to many different possibilities and is sure to be a hit. Don’t be surprised if you see the Tech-Air Race Vest at your next track day.